Sung by EDWARD HILLIER, AND GEORGE VOKES. the moon shines up above. Two ballads. 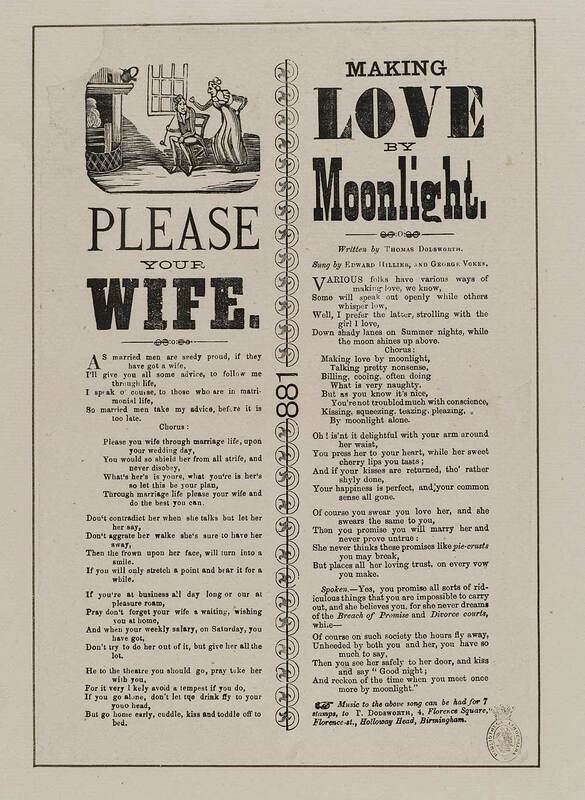 Please your wife - first line reads: As married men are seedy proud, if they/ have got a wife. Making love by moonlight - first line reads: Various folks have various ways of/ making love, we know. Making love by moonlight: Written by Thomas Dodsworth. Sung by Edward Hillier, and George Vokes. At foot of second column: Music to the above song can be had for 7 stamps, to T. Dodsworth, 4, Florence Square, Florence-st., Holloway Head, Birmingham.